Anemophily or wind pollination is a form of pollination whereby pollen is distributed by wind. Almost all gymnosperms are anemophilous, as are many plants in the order Poales, including grasses, sedges and rushes. Other common anemophilous plants are oaks, sweet chestnuts, alders and members of the family Juglandaceae (hickory or walnut family). Features of the wind-pollination syndrome include a lack of scent production, a lack of showy floral parts (resulting in inconspicuous flowers), reduced production of nectar, and the production of enormous numbers of pollen grains. This distinguishes them from entomophilous and zoophilous species (whose pollen is spread by insects and vertebrates respectively). Anemophilous pollen grains are light and non-sticky, so that they can be transported by air currents. 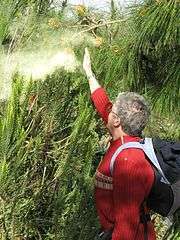 They are typically 20–60 micrometres (0.0008–0.0024 in) in diameter, although the pollen grains of Pinus species can be much larger and much less dense. Anemophilous plants possess well-exposed stamens so that the pollens are exposed to wind currents and also have large and feathery stigma to easily trap airborne pollen grains. Pollen from anemophilous plants tends to be smaller and lighter than pollen from entomophilous ones, with very low nutritional value to insects. However, insects sometimes gather pollen from staminate anemophilous flowers at times when higher-protein pollens from entomophilous flowers are scarce. Anemophilous pollens may also be inadvertently captured by bees' electrostatic field. This may explain why, though bees are not observed to visit ragweed flowers, its pollen is often found in honey made during the ragweed floral bloom. Other flowers that are generally anemophilous are observed to be actively worked by bees, with solitary bees often visiting grass flowers, and the larger honeybees and bumblebees frequently gathering pollen from corn tassels and other grains. Anemophily is an adaptation that helps to separate the male and female reproductive systems of a single plant, reducing the effects of inbreeding. It often accompanies dioecy – the presence of male and female reproductive structures on separate plants. Almost all pollens that are allergens are from anemophilous species. Grasses (Poaceae) are the most important producers of aeroallergens in most temperate regions, with lowland or meadow species producing more pollen than upland or moorland species. 1 2 3 A. K. Shukla; M. R. Vijayaraghavan; Bharti Chaudhry (1998). "Abiotic pollination". Biology Of Pollen. APH Publishing. pp. 67–69. ISBN 9788170249245. ↑ Dave Moore (2001). "Insects of palm flowers and fruits". In F.W. Howard; D. Moore; R.M. Giblin-Davis; R.G. Abad. Insects on Palms. CAB International. pp. 233–266. ISBN 9780851997056. ↑ J. D. Ackerman (2000). "Abiotic pollen and pollination: ecological, functional, and evolutionary perspectives". Plant Systematics and Evolution. 222 (1–4): 167–185. doi:10.1007/BF00984101. 1 2 Jean Emberlin (2009). "Grass, tree, and weed pollen". In A. Barry Kay; Allen P. Kaplan; Jean Bousquet; Patrick G. Holt. The Scientific Basis of Allergy. Allergy and Allergic Diseases. 1 (2nd ed.). John Wiley & Sons. pp. 942–962. ISBN 9781444300925.